Hi, I'm Irene Okech, the owner of Ivory and Pearls, a wedding planning agency for weddings in Kenya. When I got married in Kenya 2003, it was not the dream wedding I had always dreamt about. Unfortunately at the time I didn't know about the possibilities to get married in other locations different from the registrar office in Nairobi. 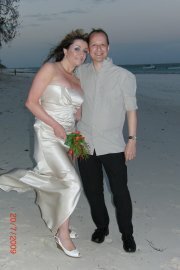 When we lived in Kenya in 2007 and 2008, we attended many weddings in Kenya in the beach hotels. I thought to myself, "Why get married in a beach hotel while there are so many beautiful and unique wedding locations in Kenya?" Actually on the beach, white soft sandy beach overlooking the beautiful Indian Ocean, in a local church, or at a wildlife park with stunning views... Elephants or zebras as witnesses... Masai warriors to entertain your guests and sing their traditional songs... a wedding never to be forgotten. 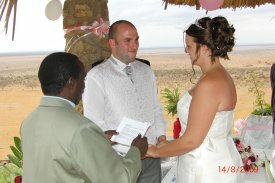 After our return to the Netherlands from a long stay in Kenya I started to work out the wedding programs for Kenya. To become professional I studied hard to become a professional wedding planner and obtained my diploma. We have, already, successfully organised several weddings. The response has been overwhelming and we feel we have found our goal. 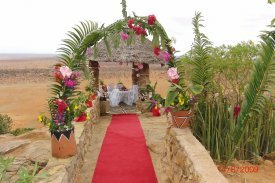 With our personal services, the knowledge about Kenya, our reliable staff having many local contacts - we are in the position to offer our clients a dream wedding to cherish for life. That is what we stand for, to organise a day whereby the bride and groom are feeling so special no matter if it is just the two of them or with many guests. All over Kenya you have the opportunity to choose your own wedding venue. With our team of flower/decoration artists, professional photographers, wedding planners, caterers for food and beverage we are the best agency to make your day memorable for you and your guests! For our European or other foreign guests we can organise the special wedding licence and also the legalising of the certificate afterwards. On our website you can read which documents are required from you. Ivory and Pearls is a registered wedding planning agency in The Netherlands and Kenya under Dutch management.